This video explains how to sell membership access to the content of your WordPress website using Cart66 memberships and subscriptions. 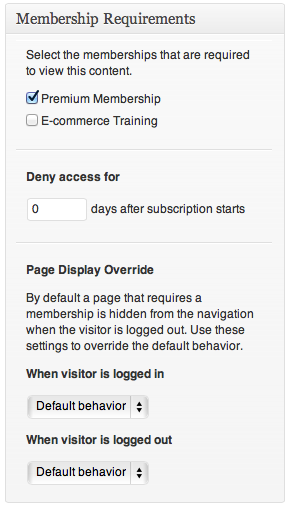 You can use membership products and/or subscriptions to sell access to content on your WordPress website. The only difference between membership products and subscription products is that subscription products include recurring billing where your customer is automatically billed at set intervals. Membership products do not automatically charge your customers. Instead, a membership product is a one-time payment from your customer that expires some time in the future. Membership products can be renewed to extend the membership but the customer is ultimately responsible for initiating the renewal. Cart66 provides lots of great features to follow up with your customers before the membership expires and remind them that they will need to renew. You can even include coupon codes in those automated follow up emails to add extra incentive to renew the membership. In order to sell access to premium content on your WordPress website, you must have at least one membership or subscription product created in your Cart66 management console. Then log in to your WordPress Admin, navigate to any page or post and click the membership or subscription that is required in order to view the content of that page or post.